What are you supporting when you shop? behind common brand names. Shop with a clear conscience. Who did you vote for today?. Our handy pocket-sized guide helps you match your shopping habits with your values. Over 130,000 copies sold since 2008! Updated 2019 edition - Just $10. Buy it today! 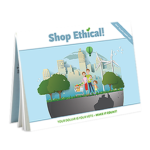 The most popular digital guide to ethical shopping in Australia, Shop Ethical! has been completely redesigned to provide consumers with the easiest way to make informed purchasing decisions. Shop Ethical! is available for iPhone and Android. More information. Take a look at the world behind your wardrobe. Explore the companies, issues and alternatives. Search our directory for buying organic, fair-trade, second-hand, vegan or locally sourced clothes and footwear. Shop Ethical! Clothing edition.